Author Alana Abbott (Chronicles of Ramlar, Serenity Adventures) and artist Jeff Preston bring another creature for our Halloween Horror collection. Those who cheat death beware, can you hear the baying of the hounds? Like their mistresses, the hounds of the Morrigan are harbingers of death, choosing those who, in battle, will perish at the hands of their enemies. A vision of one of these great, black dogs is an omen of death: warriors who see the hounds know that their doom is near. It has been said that just the sight of the hounds is enough to cause a mortal to die of fear: their coat appears both as fur and as the black feathers of a crow, their eyes glow red at a distance and swirl like pools of blood up close, and their fangs are bronze and sharp as daggers. Few who have been in the presence of the hounds survive to tell their story. But the hounds themselves are neither evil nor cruel. They, like the Morrigan, are defenders of kingship and sovereignty, and to those destined for greatness, the hounds show great loyalty. If the Morrigan bestow their blessings upon a mortal, the hounds have been known to protect that mortal from otherwise certain doom. 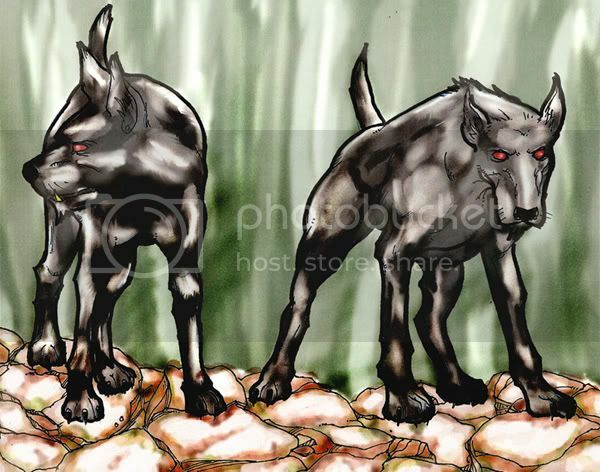 In this guise, the hounds appear only as great black hunting dogs. Though stronger and swifter than mortal beasts, they show only the faintest clues that reveal their immortal nature. Their pelt has the same oily sheen as the feathers of a crow, and rather than having four pads on its paws, the hound has only three. So long as a mortal is guarded by the hounds of the Morrigan, death will only come it is fated to be, and then, the hounds transform to their true shapes in warning. While providing omens or protection are duties of the hounds, their main function is to hunt down those who have defied death. Mortals who have lived beyond their fated lifespans become prey, tracked relentlessly across the world until their death can be meted out. But while tracking dogs must smell a victim to follow its path, the hounds of the Morrigan have greater tools at their disposal: the scent of one who has outlived their proper time exists not only in the physical world, but in the realm of the spirit. The hounds can track their prey through the dreamscape, often causing nightmares and night terrors as they approach. As in the physical world, the sight of a hound in dreams can cause such horror for the sleeper that they die of fear. For the stronger willed who hope to outwit the hounds, the practice of lucid dreaming, dampening the dream-visits of the hounds, has been known to throw them off the scent. But this works only for a matter of time: the hounds are immortal, and continue the hunt until it is concluded to their satisfaction. If they cannot catch their prey in dreams or kill him with fear, they confront the target in the waking world, using their tremendous size and strength and their horrible fangs to return those who have cheated death to their proper fate. Alana Joli Abbott is the author of two fantasy novels, Into the Reach and Departure, as well as short fiction that has been featured at the online magazines Coyote Wild and The Edge of Propinqutiy. Based out of New Haven area, Connecticut, she did not attend Yale but often plays D&D there. When not writing or gaming, she travels as often as she can, especially when she can do it for free, and she has been privileged to work as a teaching assistant in mythology on study tours in Ireland, Greece, and Turkey. You can follow her adventures on line at her blog at www.virgilandbeatrice.com or on livejournal: alanajoli.livejournal.com. She also writes reviews for Flames Rising.